Katie left for camp today! This is her second year to go to church camp in Oklahoma, and she was so excited to return there! She was wide awake when I went in to get her out of bed this morning. Ryan is equally excited! 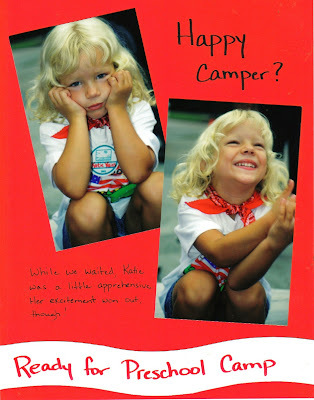 He's not going to this camp, so for the first time since Katie was born, he'll be the only kid at home. After church, we loaded up the trailer. Katie wanted to be sure to sit with her roommate. Notice Ryan running away from the People Mover! Even though he's excited about having the house (and the Wii) to himself for five days, he was really sweet about saying goodbye to his sister. He gave her a big hug before we left the house, and he made a point to go on the bus to say goodbye one more time. She and Ryan went to a one-day preschool camp in 2002. 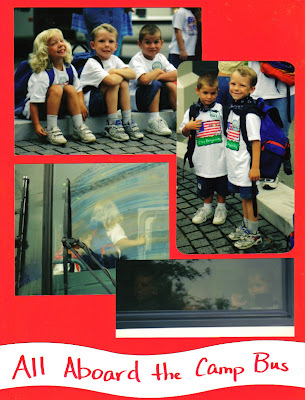 They went to Camp John Marc in Meridian and had a blast, but it was hard to see them get on that bus. Six years later, it's still hard to see Katie wave goodbye!